You know that you are in the right conference when the moderator not only knows what it is about, but may also know more than anyone else in the room. That is, with all due respect, the impression that I got when Michael Caselli, editor of numerous publications and world renowned expert in the industry, opened the Sport and iGaming Conference on November 10th. Lawinsport.com, Media Partner of The Sport and iGaming Conference, supported and attended this event organised with Pinsent Mason in their London office. A fantastic venue in the heart of London. Caselli, sporting a ponytail and a black shirt, grabbed the public attention by guessing whether iGaming was the alternative/funky side of business. Maybe so, ten years ago; now there was agreement as to the quick growth of gambling on the internet. Steve Keall, of Pinsent Masons, gave the most legalistic approach of the day; which says much about the soft marketing approach of Pinsent Masons: with presence, but not overbooking. Steve did want to involve everyone in the room. His presentation was obviously very thorough and supported, but he was gracious in gathering support and agreement from other experts attending. And in terms of content, he didn't leave anything out either. In his 45 minute presentation, he spoke about the Gambling Act and Commission, off shore tax regimes, the levy and British Horseracing Authority, advertising and sponsorship. Caselli centered the debate, gave a bit of background to the Gambling Act and referred to the licensing in different countries. Which led to the undeclared 'hot topic' of the day: licensing in France. Leo Thompson(Betfair) intervened to say that licensing in France - or other countries - is not an issue or yes or no, as much as how much. In other words: there is no opposition to a license, only to an unreasonably high license which makes it impossible to enter the market. There is quite some debate about this in gambling publications. This led to the first Case Study, presented by Andrew Croker (Perform) and Alex Gough (Professional Squash Association). Croker explained the services Perform offers. A bit of a marketing intervention, albeit very interesting. Perform is the world leading provider in video stream of sports events. This seems to have put Squash into a much higher level, in terms of audiences, in the partnership between Perform and PSA. Then a generous coffee break to be able to network the significant number of attendees, I heard in excess of 140; and then back to the program with a Panel Discussion: "The changing face of iGaming and what it means for sport". Moderated by Michael Caselli, the participants were Kevan Moretti (Racing Post), Alex Gough (Professional Squash Association), Mike Falconer(Bettorlogic) and Phil Balderamos (Sportech). It was a discussion about the impact that technology is having in sport (Ipad, iPhone, web TV and so forth), the new markets (India, America) and the impact that the iGaming is having in the format of the sports themselves. In terms of technology, the agreed advantage is the possibility of betting at home, on your mobile phone...; in the end, being able to do it in private. As to the impact in the sport, Moretti explained the actual adaptation of snooker to be more TV/betting friendly. Something with which, Gough agreed: sports with less attention need to reinvent themselves and adapt to the new requirements. This, in the end, leads to a more attractive and consumer-friendly sport format. Not that it is a bad thing, as Squash seems to be more on schedule now than before! Moretti also gave an insight to the conflict of the Levy, something of which everyone speaks about, but may not necessarily know about. The stalemate seems to be in the value assigned to the product by BHA and the gambling companies. Kevin Roberts, Editorial Director of SportBusiness Group, took the lead and, quite spontaneously, he drew attention to the same fact that Michael Caselli had pointed out: igaming is a very young industry. 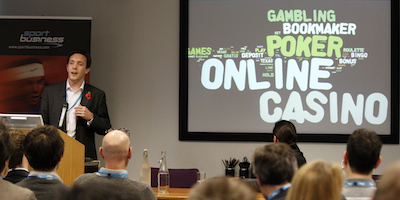 Roberts acted as moderator for 'The challenges of iGaming in sport', the second Panel Discussion. Panellists: Nick Hawkins (Danoptra), Oliver Codrington (Global Sports Integrity), Jackie Fast (Slingshot Sponsorship). Jackie Fast, an expert in sponsorship, mentioned that the igaming industry is seeing the advance of sponsorship. And then the debate went quickly onto deal with integrity in sport. All the speakers agreed that the growth of betting has also contributed to the higher risk of corruption in sport. In particular, in those countries were betting exists, but is not regulated, like India and, particularly, Pakistan. Oliver Codrington, who has recently launched Global Sports Integrity, and who used to Head Compliance and Licensing at BHA, mentioned the tri-side approach needed: regulations, observation and investigation. He gave an interesting insight in their (BHA) own learning curve when dealing with race fixing. Nick Hawkins, another barrister, put the finger on the main question: if sport is not perceived as clean, then parents will stop their children being involved. Education therefore is vital. Notice should be given to 'integrity clauses' in the contracts with sports players. We then broke for lunch which didn't seem long enough for a lot of people who were making the most of the networking opportunity offered. Michael Caselli took the lead again giving an useful explanation of the mechanics of betting in sport. I felt, maybe rightly, the receiver of that explanation. I had previously asked whether sponsoring two teams in the same competition could not lead to conflict of interest. The lawyers in the room understood my point; those of the industry reacted to it. I don't doubt the integrity of the betting companies, only the image that it may give. Mike Shaw (comScore) reviewed the statistics available which generated a lot of interest from the betting operators attending. Lastly, two case studies. Leo Thompson and Andy Lulham (Betfair), discussed the Betfair partnership with Manchester United and how they warmed up the Manchester Derby being involved in (healthy) rivalry between two teams. On the other hand, Keith McDonnell (Bodog) explained the Bodog partnership with Fulham FC as a vehicle to promote their brand in Europe. These two case studies showed two different approaches. Betfair, consolidated in the UK, shifting towards football, and Bodog, seeking to increase awareness in Europe. The event managed to finish on time with plenty of time for drinks. When I called it a day, leaving plenty of attendees in the room, I had the feeling of satisfaction of a great day, and looking forward to next year.